When you talk to the boss, are you actually talking to the boss or are you talking to a small part of the boss? In most cases, you are talking to a small part of the boss. That is why many conversations, especially those about Lean, often do not go the way you expect them to. People who are excited about Lean go to the boss to tell them all the great things they learned about Lean and how it would be great for the organization and its customers to adopt Lean management. That enthusiastic effort is rewarded with cold rejection. Why is that? We presented a logical argument consisting of the actual problems we face and propose simple, sensible, and proven methods for improvement that will eliminate the problems. It should have been a very convincing argument, but it was not. Instead, the boss told us to go away and made us feel like there was something wrong with us. It turns out that we thought we were talking to the boss’ prefrontal cortex, the newest part of the brain responsible for executive function (cognitive processes such as reasoning, working memory, and problem-solving). It is the area of the brain that should enable the boss to consider alternatives to the current state. 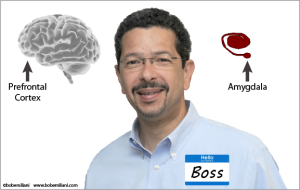 Instead, we were talking to the boss’ amygdala, the fight-or-flight (stress response) area of the brain that only considers the boss’ perspective. The amygdala is two small nuggets buried deep in oldest evolutionary part of the brain (atop the brain stem) that process emotional reactions. Our simple, well intentioned effort to inform the boss of a better way to identify and correct problems – a better future state – challenges the boss’ knowledge and authority, and rekindles unpleasant memories with bosses past, which activates the amygdala and results in a quick emotional response – “No! That’s my decision. And it’s final.” The threat has been efficiently terminated. It is difficult to get to the boss’ prefrontal cortex when the amygdala dominates information processing. It’s even more difficult to do this when the business is crisis, creating a high pressure situation where a lot of new Lean things must be learned in a short period of time. Having to learn many new things will not be perceived by the boss as likely to restore order quickly enough. Indeed, it is hard to learn new things when under extreme pressure. Lean, therefore, is not a plausible solution to the crisis. Introducing Lean management does not seem like it would be successful, so Lean is not reality to them. Instead of adopting Lean, the great majority of executives repeat the same pattern that they have done before or observed others do: lay people off, close plants and offices, squeeze suppliers, etc. For a long time, Lean people have thought that a burning platform, a crisis (or catalyst) of some sort, is necessary to get leaders to be open to new ideas such as Lean management. But, has evidence of this phenomenon influenced us too greatly, to the point where we believe a burning platform is a prerequisite for all change? Could those who have changed when experiencing a burning platform actually be the exception to the rule? Is the rule, in fact, that most do not change and die instead? Why it has been so difficult for Lean management to move beyond its position as a niche management practice. It’s not often that we can get the boss’ prefrontal cortex to listen to us. But when we do, great things can happen. In a way, you can view the whole point of Lean is to lessen the amygdala’s dominance in information processing so that the prefrontal cortex, the Lean thinking part of the brain, can be become more dominant. Only then can people discover problems, learn, and improve the value proposition for customers. Learn more about the “hidden brain” that drives management resistance to Lean, and what you can do about it, from Dr. Mark Jaben. Maybe you need to empower executives in order to make them happy to empower their teams? The Fight or Flight response explains a lot on our interactions between an employee and the manager. Another concern when proposing change to a Lean Process occurs when organizations need to take small steps and other teammates want a complete Lean Process in a short period of time.